The moment we saw this elegant and highly practical spatula, we had to have it on our shop. It is designed and manufactured by Clea Jentsch, who is doing a BA in Product and Furniture Design at Kingston University. 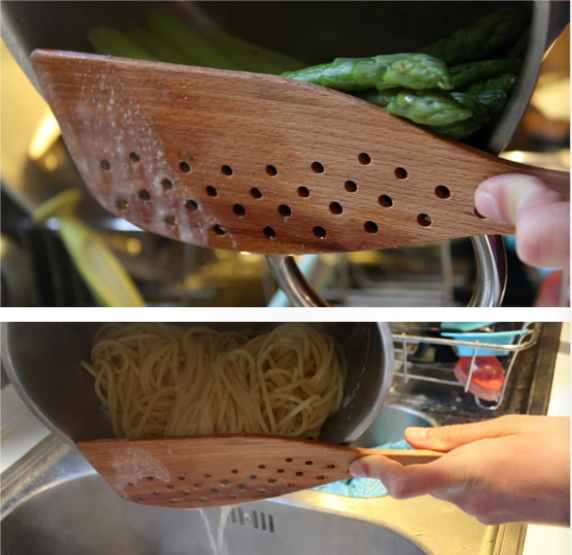 Its width and length, in relation to the ingeniously drilled holes makes a perfect for draining pots, whilst holding the pot's food contents back. This is helped by the curved bottom edge which matches the arc of the pot.